Worry about what you get will be far away from what you see here ? SNZM Jewelry will help you end it up ! We Offer a 100% MONEY-BACK GUARANTEE, NO HASSLE RETURNS, & FREE SHIPPING ON EVERY ORDER. ❉MATERIAL: 14K gold plated Lead&Nickle-Free base metal. ❉DIMENSIONS: Inside Perimeter for 8.5 inches; Width for 0.3 inches. 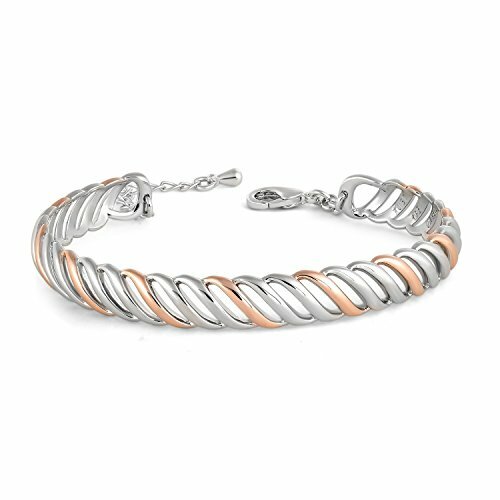 ∭ Design: Vintage white and rose gold color twist bangle cuff bracelet. ∭ Specification: ①Inside Perimeter: 8.5'' (Adjustable) ②Width:0.3'' ③Weight: 0.38 oz. ∭ Material: Lead&Nickle-Free copper basic metal plated with 3 layers 14k white gold and yellow gold, also passed Swiss SGS Inspection. ∭ Package: High-end elegant gift jewelry box packaged, make this jewelry to be a perfect gift for her or yourself. ∭ Warranty: Life time warranty for replacement or full refund by any quality problems.